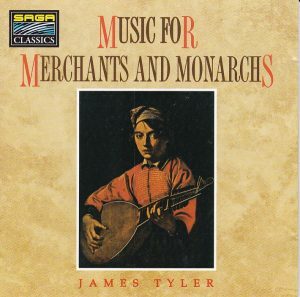 A pleasant recital of Renaissance music for lute, archlute and guitar, played on period instruments by James Tyler, recorded in 1975 and originally released on Saga 5420, and the reissue comes in excellent sound. 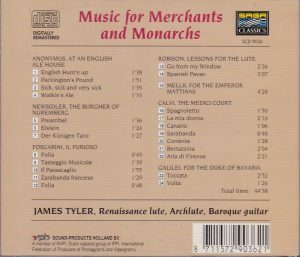 Works by the tremendously productive “anonymous English” (tracks 1-4, played on Renaissance lute), Hans Newsidler from Nüremberg (5-7), Giovanni Paolo Foscarini (8-12, baroque guitar), Thomas Robinson (13-14, lute), Pietro Paolo Mellii (15, archlute), Carlo Calvi (16-22 baroque guitar), Michelangelo Galilei (23-24, archlute). Some of it is meditative, nostalgic, dreamy and/or plangent (beautiful slow Passacaglia by Foscarini, track 10), but even when the music is more joyful, dance-like or boisterous, there always remains an appeasing gentleness to the instruments. It’s all very soothing and easy-listening. TT 44:38 – this is the straight reissue from the LP. I came to this CD as I was researching the CD reissues from the Saga catalog. Saga was a British label from the LP era, but the CD reissues that I’ve seen came from the Netherlands. Some were made by a Sound-Products Holland BV, label numbers SCD 90XX, barcode 871157290XX2Y, no copyright date to give an indication of when they were released. Then, in the mid-1990s, they appeared or re-appeared under the auspices of Emergo Classics, Saga Clasics EC 33XX-2, barcode 01686133XX2Y. The one I have of this program is SCD 9036, but it also came out as EC 3365-2. 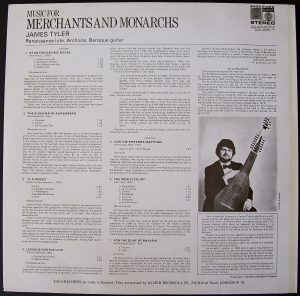 In my edition the liner notes of the original LP (by James and Joyce Tyler) have been retained (with a few typos, like Robinson’s – he’s also spellt Robison on the back cover -“Lessons for the lute” becoming “lessons for the flute”), except, alas, for the description of the instruments used. 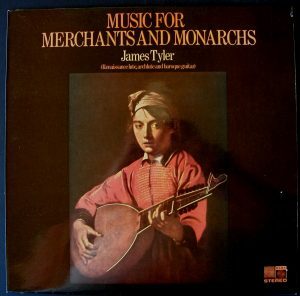 James Tyler was an American guitarist and lutenist, 1940-2010, closely associated with Anthony Rooley’s Consort of Musicke.